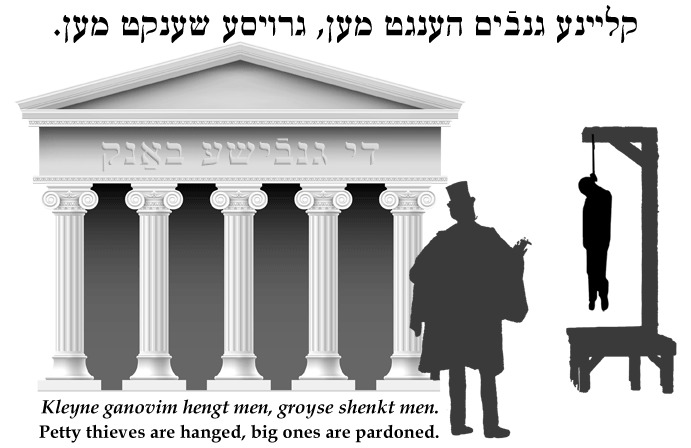 Yiddish Wit: Petty thieves are hanged, big ones are pardoned. קליינע גנבֿים הענגט מען‫,‬ גרויסע שענקט מען. Kleyne ganovim hengt men, groyse shenkt men. Petty thieves are hanged, big ones are pardoned. SOURCE: Kumove, Words Like Arrows. These words are from a song in the play "Din-toyre"[NOTE]din-toyre: case before a rabbinical court. by Urke Nakhalnik (pseudonym of Yitskhok Farberovitsh). Read about Nakhalnik's unusual life trajectory from yeshiva student to criminal to author to saboteur against the Nazis.